If you find yourself in Addis Ababa, promise me that you'll stop in for a drink at Yod Abyssinia. After arriving at the hotel we swam, suanaed and steamed ready for an evening in the capital. Piled into two taxis we excitedly arrived to the beat of drums and aroma of delicious spices. Above the entrance into a courtyard the sign read "Yod Abyssinia" where the path curved around past a gift shop closer to the beating drums. Dressed in traditional white robes with beautiful pattern the staff ushered us to a table. We wound our way through the beautifully designed room, breaming with traditional heritage and pride. On a stage at the front, the band play and the dancers perform. We take our seats and applaud the performance. Leonine and I order Dashen beer, a northern beer with a delicious hoppy taste. While the guys order Tej. Oh Tej, you uncomfortably delicious tasting thing you. It's a local drink, a homebrew, with hazy alcohol percentages. After the 2008 incident with Erhiopian homebrew gin, and temporary loss of senses, I kinda avoid homemade alcohol. I couldn't resist a taste though of this honey derived cultural export. The waiter brought over some cloths and large tea pots of warm water to wash our hands with. The reason for this ceremony is because what's about to follow is a very social means of eating. A group of waiters started brining pot after pot of spiced dishes. Each dish was spooned out onto the injera plates in the centre of our table, bring us all together closer. Now, if you're new to Injera it can be kinda intimidating at first. The utensil that you use is the injera itself, a sour but delicious pancake type element. 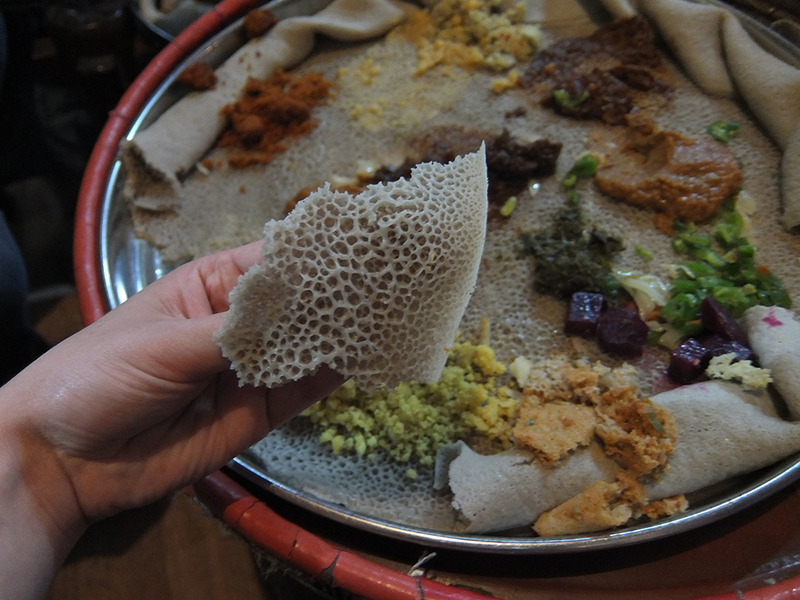 It's so easy to get overwhelmed by all the delicious dishes that sit atop the injera, and just get stuck in and Woolf it all down. But, the process is a marathon not a sprint, and with most dishes, there's often more to come. It's such a social and delicious way to get everyone together. We all ate, drunk, shuffled to the music, and had such a perfect evening- Bon appetite!